I bought a Wobble Cushion in 2012. My balance was much better then than it is now in 2016 multiple sclerosis has killed off my walking and sense of balance.. Nowadays I cannot walk unaided. So what is a wobble cushion? The best description is to imagine a rubber cushion filled with air and it is made of very thick rubber. What can you do with one? You can stand on one, sit on one or you can lie on one. 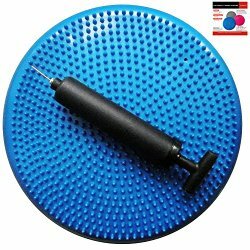 It is an extremely versatile piece of equipment that combines the advantages of a gym ball, sitting cushion and wobble board. I use mine to improve my balance and core stability. Why do I use a wobble cushion? Foot drop caused by multiple sclerosis has destroyed my sense of balance . I try to stop my balance deteriorating too much by either sitting on an air cushion with my eyes shut or try to stand on it but my eyes must be open to do this. Even sitting on one buiids up my core muscles and that will help me with walking and balance. I put the air cushion onto a hard kitchen chair and sit on it. I then close my eyes and move alternate arms from pointing down to pointing up like a clock hand moving between 6 and 12. All the time I’m sitting upright, or at least doing my best to be upright. While doing this I just have to hope that no one else is watching me. I ought to do about 20 minutes of exercises with on an cushion each day. Needless to say I don’t but then I do try to maintain my balance by walking using my rollator. Now it is a very slow walk, blame the MS. I must also make sure I continue to use the wobble cushion as much as possible. I know it is good for my posture, tummy muscles and core stability. Its a sort of simple pillates. She just stands on ours air cushion with out any support and has a chat!!!!!! Tell me how good you are with a wobble cushion. Use the comments box below. very good .. comes in very useful as I have recently had knee surgery and this helps with my rehabilitation. As a wheelchair user excersing with limited capabilities ‘The Cushion’ is just wonderful.